LH Foundation, Inc. brought last year reputed speakers together such as Bro. Bo Sanchez, Francis Kong, Joey Concepcion and Coach Norman Black for “AIM High” Leadership conference held at the Pavilion of Oakridge Business Park in A.S. Fortuna, Mandaue City. The conference received positive responses and was well attended by Cebuanos – students, businessmen and professionals alike. 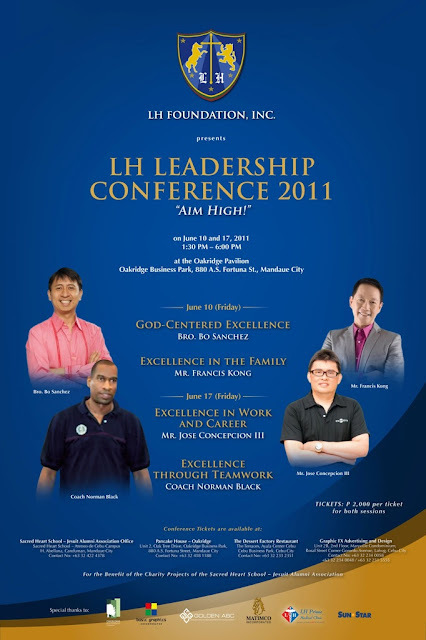 There are talks that the LH Foundation will once again hold another leadership conference on July 27, 2012 at the Pavilion of Oakridge Business Park. "Sports and being a Champion in one’s respective field" will be the focus of this years Leadership Conference. The roster of speakers for this year’s conference has not been revealed as of this posting and as expected that it will be another set of esteemed speakers that will inspire and enlighten conference attendees, most of whom will be young professionals, parents, teachers and students. LH Foundation, Inc. has not posted official details to confirm the leadership conference yet. I will update this post as soon as the organization has confirmed. 0 comments: on "LH Foundation Leadership Conference 2012 at the Oakridge Business Park"